Good Investing offers one-on-one investment coaching to build a custom portfolio with a positive social impact. The goal is to help one million Canadians invest their money intentionally, aligning their investments with their values. 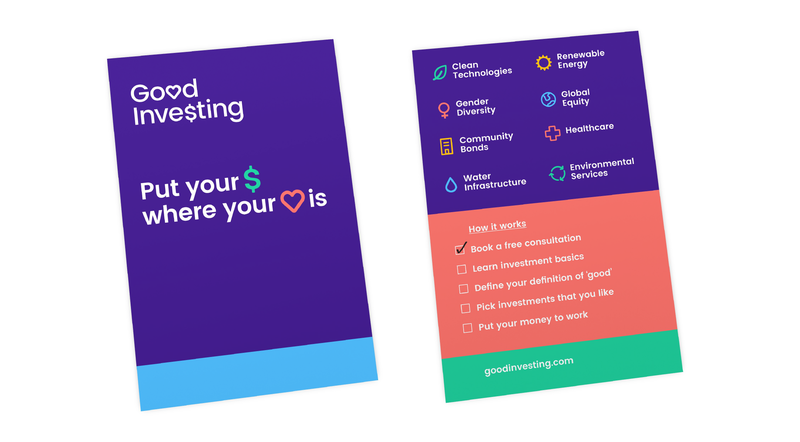 In a field that many people find intimidating, Good Investing provides a personalized alternative that leaves clients feeling good about their money and empowered to make financial decisions. To help this new business make a splash, we provided strategic support and designed all touchpoints of the brand. In our discovery process, we personally experienced the full customer journey and researched the competitive landscape to identify a brand strategy that would set Good Investing apart. 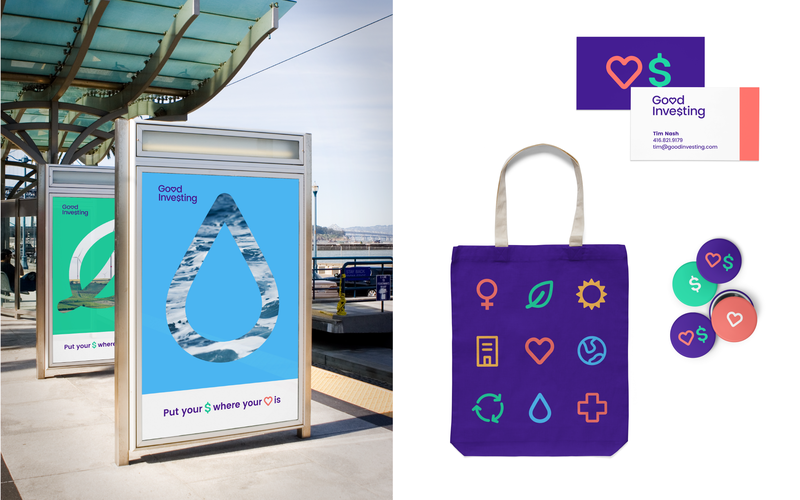 We crafted a clever logo and slogan that communicate the idea of putting your money where your heart is. The supporting visual identity system is approachable and optimistic. 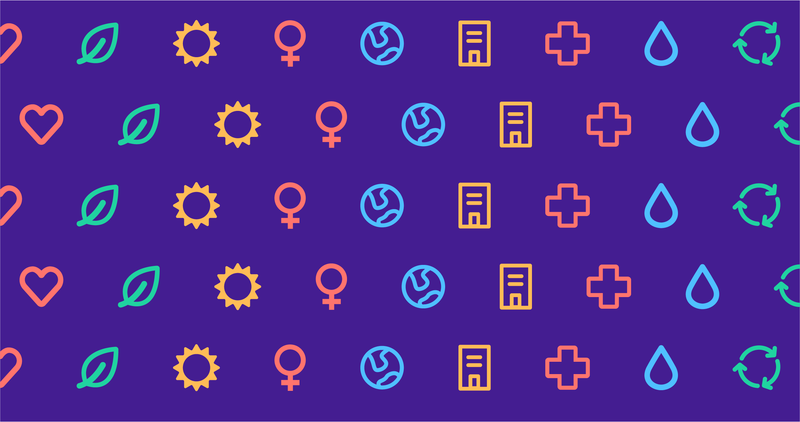 Building on the heart and dollar sign in the logo, a series of icons indicates various impact investment opportunities such as solar energy funds, community bonds, and companies that prioritize gender equity. 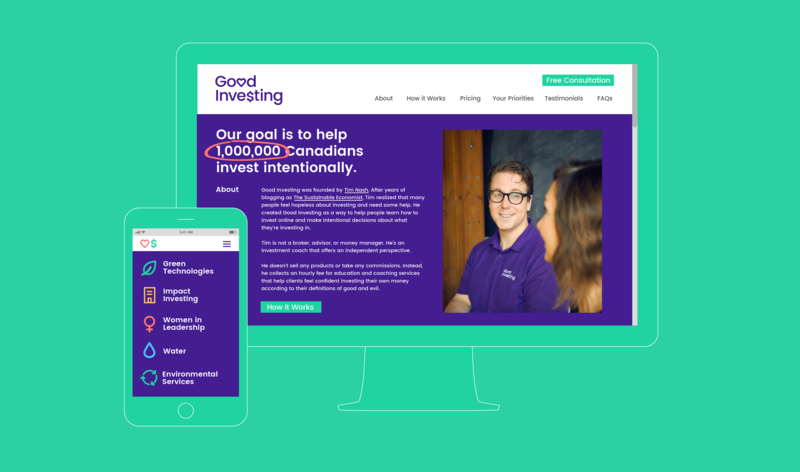 We created a website, additional marketing materials, brand guidelines and branded polo shirts for investment coaches to wear to client meetings. The visual identity system, website and marketing collateral have proven successful in helping Good Investing to establish a brand voice, introduce their offering, and attract new business. Requests have poured in from prospective clients across Canada who are eager to invest their money with intention.